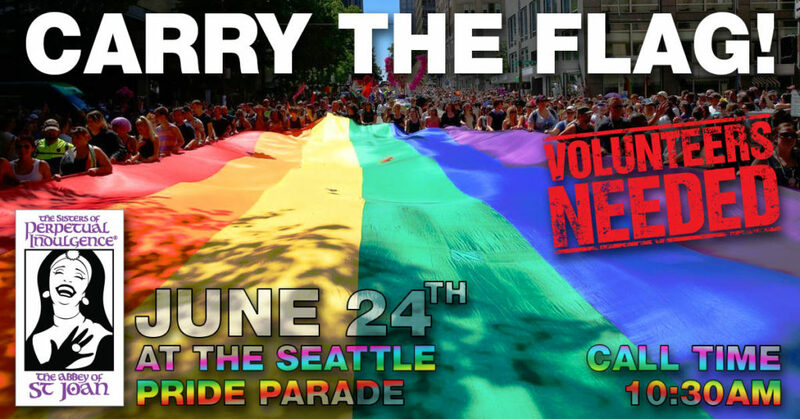 Home » Events » CARRY THE FLAG! The Sisters of Perpetual Indulgence – The Abbey of St. Joan get the honor of carrying the PRIDE Flag once again at this year’s Pride Parade! And we want you to join us! The flag is really big and we need all the folks we can get to help us. All genders, ages, creeds, races, orientations and abilities are welcome! Bring the whole family! The one catch: there is a dress code. All walkers/volunteers must wear an official SPI-AOSJ T-shirt or tank top to signify you are with our contingent (or at least a black shirt or tank top). Each shirt/tank is $10. That’s our cost, you won’t find one of shirts at that price anywhere else! Shirts are available for reservation by contacting Sister Salome Getzhed at salome@theabbey.org. Safety tips: Wear plenty of sunscreen, bring bottled water, bring a snack and wear sensible shoes! Please signify that you would like to attend on the event page and email volunteers@theabbey.org too so that we can add you to our list of volunteers.